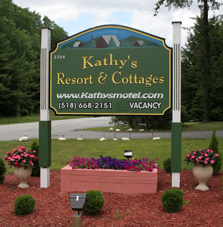 Kathy's Lake George Resort and Cottages in Lake George NY: A Great Place To Go Stay In Lake George New York! 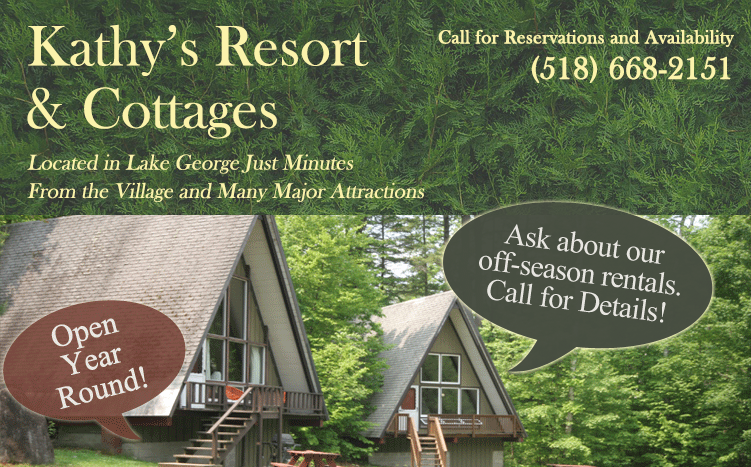 Kathy’s Resort & Cottages - The Perfect Lake George Vacation Spot! Open All Year! 10 minutes from West Mountain, 30 minutes to Gore Mountain. Snowmobilers love Kathy’s because we are conveniently located close (6 minutes) to the snowmobile trails. Located on the southern edge of the six million acres of Adirondack Park, Kathy’s Resort and Cottages offer a quiet escape from the crowd while providing easy access to all the major attractions. We are within one mile from the lake, the Village and five minutes from Six Flags Great Escape Park and the Lake George Outlet Stores, as well as 25 quick minutes from the action at Saratoga Casino and World Famous Racecourse. Our family owned facility is nestled among six heavily wooded acres of graceful birches and majestic pines providing all the conveniences within a relaxing, secluded atmosphere – Therefore our old friends and families come back year-after-year considering Kathy’s their favorite summertime hideaway – We welcome you to become one of our new “Old” friends! Kathy’s prides itself on providing scrupulously clean, smoke free facilities. Fully equipped kitchens, full baths with tub and or shower, central air, heat, cable TV with extended HBO, some with DVD’s and facility wide free Wi-Fi and in-room phones. Picnic tables with gas grills (In season) are provided for each Chalet, House, and Suite. Linens are provided and can be changed as needed. Efficiency and Non-Efficiency Studios are serviced daily, at your discretion, by our courteous staff with full access to our spacious picnic grounds with picnic tables and gas grills in season. A large sunny heated pool (Hours of Operation: 10 AM to 10 PM daily in season) is set away from the road and conveniently located. Our play area includes Swing Set, Volleyball/Badminton, Ping Pong and Basketball Hoop (in-season). Play equipment is at your disposal in our Office on a first come basis. Call 518-668-2151 to make a reservation today!